Ride over the freshly groomed North Shore trails on your fat tire bike. In the winter time, you can stay at Cascade Lodge and ride the 17km Norpine Fat Tire Bike Trail right from your doorstep then come back and warm up next to your cabin's fireplace! 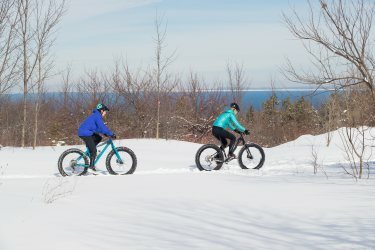 In January, the Norpine Fat Bike Classic fat tire bike race runs through the boreal forest, along the rugged ridgeline of the Sawtooth Mountains, with Lake Superior serving as the backdrop. The course is primarily on cross country ski trails, with the long distance going all the way to Cascade River State Park and back. The race includes a mass start with long and short racers starting together, beginning at Superior National Golf Course. The cart paths at Superior National are also groomed for fat tire biking.